The successful WA under-13 squad. ARMADALE soccer player Keegan Grant was part of the under-13s squad that produced some exciting football at the recent National Youth Championships in the under-13s and 14s. 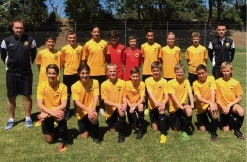 Football West technical manager Cris Ola said WA teams produced some of their best performances in National Youth Championship history at the tournaments in Coffs Harbour. Ola said both teams had played exceptionally well in finishing second in their Group A competitions. “Both teams played with a structured build-up and they took a proactive approach to defending, which produced a very good brand of football,” Ola said. “The under-14 team didn’t lose a game and were the only team to beat the eventual winners Victoria Metro, who they handled comfortably in a 4-1 victory in the first game.